Denstone D-57 support media are the most widely used support media in the world. With their unparalleled consistency and reliability, Denstone D-57 support media remain the industry standard. Denstone D-57 support media offers. High Thermal Shock Resistance: Unique NorPro™ technology yields support media with a high thermal shock resistance. Denstone supports will retain their physical properties when exposed to thermal cycling. 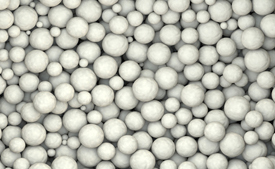 Poor quality spheres will break, chip or spall, leading to adverse process efficiency and increased operating costs. Will Not Contaminate: Denstone media are engineered for maximum resistance to attrition and thus minimize the possiblility of catalyst contamination thereby extending the catalyst active life and reducing the operating costs. Will Not Poison Catalyst: Denstone support media are free of sulphur, boron and other common catalytic poisons. Manufactured Denstone ® media have a leachable iron content, expressed as Fe2O3, of less than 0.1%. Furthermore analysis of Denstone® media boiled in 10% hydrochloric acid for 64 hours indicates a leachable iron content of less than 0.005% by weight. Tests establish that leachable chlorides and sulphur are each less than 1ppm by weight for both crushed and uncrushed Denstone media. Copyright © 2019 Alchemy Trading Company.